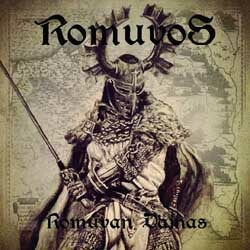 “Romuvan Dainas” is the debut album of the one-man epic pagan folk metal band Romuvos from Lithuania. It is the personal project of Velnias, who was born in Lithuania and now resides in Israel. Through his music he wants to express his love and respect for the ancient culture and folklore of Lithuanians and Baltic peoples. The band’s debut album came out of nowhere and it was released by the German label No Colours Records in the end of April 2014. Velnias has managed to create a wonderful, simple, melodic and honest album! His music is deeply influenced by Bathory and Falkenbach, moving from slow to mid-tempo rhythms and from acoustic folk to epic pagan metal. “Romuvan Dainas” includes 8 long songs lasting almost for 49 minutes. Acoustic and distorted guitars, epic synths and traditional folk instruments create the perfect canvas for Velnias epic clean vocals. His voice is so melodic, calm, epic and melancholic, in perfect balance with the harmony and lyricism of his music. And while the band’s sound is clearly influenced by epic pagan black metal, Romuvos avoids any extreme outbreaks or brutal vocals, almost torturing the listener… There is a unique epic folk pagan mood throughout the whole work and an almost magical nostalgic atmosphere. This beautiful tranquility and serenity in this album helps the listener sink deeper in the music and travel back in time. The production is quite good, I believe though that a more natural sound with more authentic traditional instruments could raise the music in much higher levels. Lyrically the album speaks about the pagan traditions of the Lithuanians and Baltic peoples, but is also influenced by occultism, as well as by other ancient cultures and epic themes. All lyrics are in English, except for the closing track in Lithuanian. I didn’t expect it at first listen, but this album is really captivating, a very pleasant surprise! Romuvos is a “must listen” for fans of epic pagan folk metal, especially for those who prefer a calmer approach with many acoustic passages. Atmosphere and enchanting melodies is the strong card of this album, whose each song is the best, until the next one begins! “Romuvan Dainas” is released via No Colours Records in a standard jewel-case CD with 12-page booklet, including all lyrics except for the last song. Cover artwork is by Velnias himself and layout by Rene. You can visit the band’s official profile on Facebook for more info and sound samples.